Hip arthritis is a common condition, affecting between 3-6% of the Caucasian Population (1). There is a lower prevalence in Asian, Black and East Indian populations. It can be due to multiple things, such as osteonecrosis (Death of the femoral head), trauma (Fractures), Sepsis (infections) or rheumatoid arthritis. Newer ideas have implicated a condition termed Femoroacetabular Impingement in its cause. This occurs when there is a mismatch between the ball and socket parts of the hip joint. Hip pain often affects the groin, but pain can radiate to the buttocks, lateral thigh and knee. It is important in assessing hip arthritis to ensure that there is no other cause of the hip pain prior to performing any surgery. This may include an assessment of your back, or knees with a physical examination or imaging. Imaging may include X-rays, Ultrasounds, CT scans or MRI scans. A surgeon will determine which investigation is the most appropriate. Dr Chien-Wen Liew assesses patients for hip arthritis by performing a thorough history, physical examination and then plain X-rays. Not all hip arthritis requires surgery. In the case where it is not significantly impacting on daily living, it can and should be treated with medication, walking aids, and activity modification. 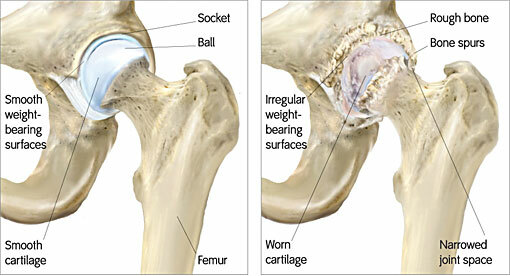 Once hip arthritis is advanced enough, then a total hip replacement is warranted. Evidence in the past has shown considerable benefit with some non operative measures. This includes a walking stick, held on the opposite side to the arthritic joint, glucosamine, fish oil and anti-inflammatory medications. Young hip arthritis is a major issue, as we know that hip replacements do not last forever. They are the same as any other bearing surface, such as the bearings in a car, which wear out due to use, over time. Unlike a car, the particles generated from wear in a prosthetic hip joint cause damage to surrounding bone due to the body’s reaction to the particles. This causes the bone to weaken, making it much more difficult to perform the next hip replacement. If the prosthesis requires removal, the following one will be in non-ideal bone, where alternative measures would be used to bypass any damaged bone. There is a reluctance to perform hip replacements in patients under the age of 60 for this reason. In many cases, hip pain in the young is not due to hip arthritis, but rather femoroacetabular impingement. This diagnosis needs treatment, often surgically, as it is known to lead to osteoarthritis of the hip. When patients are even younger, such as in their 20’s, hip arthritis is usually due to trauma as a child, congenital deformity at the hip joint, infection damaging the hip joint, or a condition called femoroacetabular impingement. This can lead to rapid advanced arthritis, and render the hip joint extremely painful. An arthrodesis is a procedure where the hip joint is fused, or stiffened so it not longer moves. This relieves pain but does not allow the hip to move. This can be a very successful operation in the young. Depending on the method of arthrodesis, the hip joint can be reconstructed with a total hip replacement in the future if required.